Iran-Russia alliance has obtained a breakthrough in Syria by avoiding a regional war with unimaginable consequences and by stopping the US government’s bid to trigger another aggressive war in the Middle East. Both Russia and Iran made it clear that they would support Syria in the case of a US aggression and this was certainly the main reason that pushed the Obama Administration to have second thoughts about an attack on Syria. Although Syria and Iran have been the targets of the latest Western threats, Moscow knows that Russia and China are the ultimate objectives of the US military and diplomatic strategy. In recent years, Russia has set up a military alliance, the Collective Security Treaty Organization (CSTO), which has become a pariah for the West and NATO. The war on Serbia, the independence of Kosovo, US support for pro-Western forces in Georgia, Ukraine and Azerbaijan and the deployment of parts of a US defence missile system in Europe are clear evidences of Western contempt for Russia and its interests. The US has also pledged to undermine Moscow's Eurasia Union project, which it is seen as a recreation of the former Soviet Union. Andrei Arashev, the deputy director of the influential Russian think tank Strategic Culture Foundation, said in June that the intervention of the United States in Central Asia and the Middle East would endanger the territorial integrity of Russia, China and Iran. Due to this fact, Arashev called for a “strategic alliance” between Iran and Russia: “The destruction of Arab states in the immediate vicinity of Iran and on the distant periphery of Russia and China, the perspective of a military intervention in Syria or the fall of Syria into chaos would have a direct impact on the national security of our countries. To put it another way, in order to prevent combat on the streets of Iran and then on Russian streets, we must stand on the side of our ally Syria”, wsws.org quoted him as saying. Russia and Iran are already cooperating on security issues in different regions. Both countries share important interests. They want to strengthen security in these nearby regions and prevent extremist groups from taking over power in Afghanistan, Syria and other nations. Of course, there are still problems in the bilateral relations, especially the Russian refusal to deliver the S-300 air defence system to Tehran. However, both sides are working to solve this problem, which has become a propaganda matter for Western media, which claims that Russia is actually an untrustworthy partner not only for Iran but other countries too. Recently, Russian newspaper Kommersant reported that Moscow could offer an alternative air defense system, Antey-2500, to Tehran. Antey-2500 is an advanced system, which can simultaneously target up to 24 airplanes and cruise missiles within the range of 200 kms or intercept up to 16 ballistic missiles. The system has been specifically tailored for the needs of ground forces and might satisfy Iran's needs, according to Russian sources. Kommersant also reported that Russia will discuss an expansion program for Bushehr nuclear power plant. Other reports claim that Iranian physics students have resumed their courses in Russian institutions. 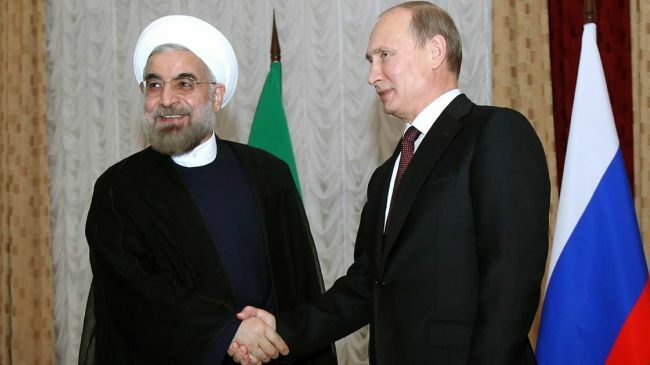 All this suggests that Russia is fully determined to strengthen its relations with Iran. Russia has repeatedly warned the West and Israel against any military strikes on Iranian nuclear facilities or attempts to isolate Iran. At the same time, Russia has asked Tehran to be quick to cooperate with the International Atomic Energy Agency. “Attempts to prepare and implement strikes on Iranian nuclear facilities and on its infrastructure as a whole are a very, very dangerous idea. We hope these ideas will not come to fruition,” Russian Foreign Minister, Serguei Lavrov, said. Iran denies it is trying to develop a nuclear weapon and stated that its nuclear program has only peaceful purposes. Of course, Iran and Russia know that the West's real problem with Iran has to do with its ideology of justice and resistance and not with an alleged attempt to produce that kind of weapons, which only Israel has in the Middle East. At the same time, Moscow has blocked Western attempts to pass more sanctions in the UN Security Council over Iran´s nuclear program forcing Washington and its allies to approve unilateral sanctions, whose impact is considerably lesser than international measures. Russia's firm negative to pass a recent UN report critical of Iranian missile tests has virtually ruled out any expansion of the sanctions regime. This Russian position has been supported by China and other SCO members. In the last SCO summit, participants said that the threat of military force and unilateral sanctions against Iran are unacceptable. Iran has an observer status in the SCO and has not been offered full membership up to now because of UN sanctions. However, Russia Today, a state-sponsored outlet, published recently an article noting that Iran’s membership would have unquestionable benefits for the SCO. For Iran, full membership would also have large political, economic and security advantages. The US Administration fully understands that a war with Iran is no longer an option “on the table” because it would have tremendous costs for the US, its economy and the whole world in general. On the other hand, the sanctions have not broken Iran’s willingness or made it surrender its rights. After the resolution of the Syria crisis with an agreement, Moscow is at a good position now to broker an agreement between Iran and the US in order to promote another deal over the Iranian nuclear program, provided the US is really interested. Most Russian experts consider that a thaw in the relations between Iran and the West, particularly the United States, would not mean a setback for Russia’s interests. They estimate that any such thaw would be a limited one because Iran is not going to renounce its basic principles and values that stir discontent in the West. In contrast, they consider that there are no obstacles to Russian-Iranian cooperation. However, Russia also understands it cannot compete with China, which is the main trade partner and source of investment for Iran, in the economic field. In the next years and if the nuclear crisis is resolved, the US will probably try to separate Iran from Russia by using political tricks or economic incentives. However, Iran cannot forget that the US is and will be an untrustworthy partner because it is vulnerable to pressure from its hawkish allies in the region, mainly Israel and Saudi Arabia, and their lobbies in Washington. Therefore, the development of a strategic partnership with Russia is an imperative for Iran. From the Iranian perspective, the Russian link will strengthen its position when it starts the next negotiations with the P5+1 (the United States, Britain, France, Russia and China plus Germany) group and even with the US directly. For Russia, Iran is a crucial and inestimable ally which can help Russia to avoid future crises in the Middle East, the Caucasus and Central Asia.